Christian Education and faith formation is a priority at St. John’s. It takes the form of Sunday morning Bible Study, Wednesday morning Women’s Bible Study and Prayer, Sunday School classes (Nursery through High School), occasional Confirmation classes, and of course, through the reading of the Holy Scriptures at Eucharist and Morning Prayer services. Education programs also include a Wednesday night study during Lent, and Vacation Bible School in the summer. Teaching skills are obviously desirable, but willing and enthusiastic volunteers can learn to teach through carefully selected curriculum which is “new-teacher” friendly. Creativity is an asset which can be expressed through program planning, lesson execution, and art and music activities. Music and art skills can help children express their love of God and can be added to education activities by the teacher or someone other than the teacher. Knowledge of the Bible is most important. However, if you want to become more thoroughly acquainted with God’s Word, teaching is a wonderful vehicle through the curriculum and working with other teachers. Not to mention that the children often teach us a thing or two! St. John’s has a Christian Education staff, headed by the Rector and the director of Christian Education. 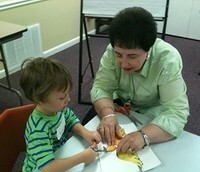 Staff includes Bible Study leaders, Sunday School teachers and volunteer art and music persons. We meet in August to plan the annual Program Year Kick-off celebration, determine curriculum and class configuration and to assign teachers for the classes. We hold additional staff meetings to plan Advent and Lenten themes and activities (both of which are often involved in outreach projects), Sunday School Recognition and honoring of graduates, and Vacation Bible School. Parents and young people are always encouraged to bring friends to our church to participate in our Christian education offerings. If you love the Word of God, if you are comfortable in teaching situations, if you enjoy assisting in a learning environment, if you feel blessed by the presence of children, you might want to consider this ministry.